While students and faculty seem to agree on the importance of technology in education, the two groups do not agree on how well it's being implemented. According to new research released Monday, only 38 percent of students indicated that their instructors "understand technology and fully integrate it into their classes." 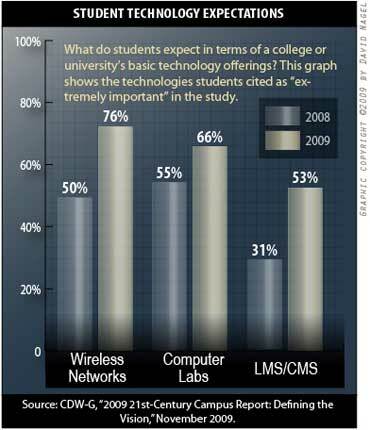 Students also rated that lack of understanding as "the biggest obstacle to classroom technology integration." The report, "2009 21st-Century Campus Report: Defining the Vision," released by CDW Government, polled about 1,000 students, instructors, and IT department staff members in order to gauge their attitudes about technology used in education and their expectations for the future. "Ten years into the 21st-century, we still lacked consensus on the features that define the modern college campus. To answer this question, we asked the educational community to identify the elements and strategies necessary to prepare graduates for success now and as they move into the modern workplace," said Julie Smith, vice president, higher education for CDW-G, in a statement released to coincide with the report. "Across the board, students, faculty and staff view technology as a means to bring the campus community together and further educational goals. They all acknowledge that we haven't achieved the vision, but their insights have set a clear path forward." Course management systems (53 percent in 2009 versus 31 percent in 2008). The complete report is available for download now. Further information and a link to the PDF can be found here.